Nowadays, you can find QR (quick-response) codes on everything. These odd-looking, black-and-white, pixelated designs were originally used by the automotive industry, but today they are most often found in magazines, newspapers, and online. QR codes offer an efficient way to create links to websites, etc. First, you need a QR-code app and a smartphone or tablet equipped with a camera. When you launch your app of choice, you'll see that your phone's camera is activated, with an on-screen framing guide. Line up the camera on your device with the QR code you want to scan, and hold the device steady until the app can read the code in front of it. For the best results, aim your device squarely at the code, and not at an angle. When the app has recognized the QR code, it will beep and display the info the code contains, or launch your Web browser to take you to a designated URL. 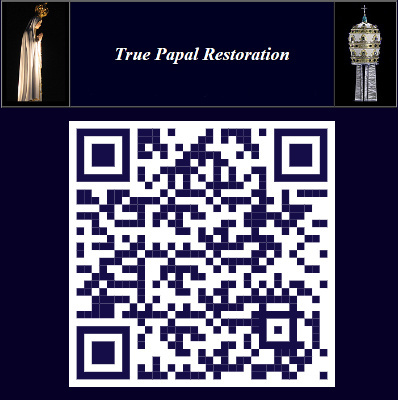 Please send our True Catholic News site to others to help promote Papal Restoration. Hail Gregory XVIII! I am a techno peasant, but could the image be printed out onto labels for postings? Hi Fern. Yes and in varying sizes too. We hope you can come to the next (larger) meeting to receive the Sacraments & continue the planning for Brittany, FR. Does the Pope have any writings? We were entrusted with a formal allocution from Gregory XVIII that we thought was to be posted on the Feast of the Assumption, but were instructed not to (at that time). Please feel free to print or post TCW's True Catholic News "QR CODE" on any venue (blogs, social media, pamphlets, decals) you see fit. All of these apps are free to download, and each one should handle any standard QR code just fine. iOS users should check out RedLaser.com. Android fans can try either RedLaser or QR Droid, and BlackBerry users will like QR Code Scanner Pro.